The roots were so small and nothing labeled so I hope I planted the right plants. If you need color this is the plant! I was doubtful when purchasing plants online but have to admit that these are stunning!! I planted these in with my wildflowers 2 years ago. They astonish me every year! Wonderful plants, they came packaged well with no damage done, planted in my garden and so far so good. In fact they are already showing signs of growth. 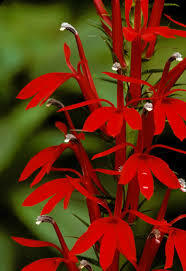 The Red Cardinal Lobelia is an accent plant that grows in zones 3-9 in full sun to partial shade. They grow best in moist clay that is neutral or alkaline. It has tall spikes of bright red flowers that bloom in mid to late summer. The Red Cardinal Lobelia has a medium growing speed and will reach a height of 35-47 inches with a spread of 18-23 inches. Red Cardinal Lobelia can be made into a herb and used to treat epilepsy, stomach aches, worms and also cramps. It can also be created into ointments and used on wounds and sores that appear on the skin. The foliage of this plant can be crushed and made into a paste, and when applied to the head it helps with headaches. Cardinal Flower is a beautiful red wildflower that is native to North America. It is usually found growing in naturally wet places like stream banks, riversides, ponds, or swamps. However, it makes a beautiful addition to any garden. The Cardinal's bright scarlet bloom, which was named after the fashionable cardinals of the Roman Catholic Church, make this plant stand out in any crowd of plants.The flower stalk forms erect spikes with numerous blooms at the top in mid-summer to early fall. Most other flowers have faded with the heat of the season by the time the Cardinal blooms. Birds and butterflies are attracted to this plant because of the nectar in the tubular blooms are easy to access. This plant will continue to grow year after year, reseeding itself in the right conditions. The maintenance of this plant can be difficult at times for it needs perpetually wet soil to naturalize. It is however used as a medicinal plant. The Cherokees used it to ease coughs, soothe stomach aches, and dispel worms. Red Cardinal Lobelia would be a wonderful addition to any landscape.